A fossil cloud of gas, orphaned after the Big Bang, that reveals how the first galaxies were formed, has been discovered in the distant universe by astronomers using the world’s most powerful optical telescope, the W. M. Keck Observatory on Maunakea, Hawaii. Robert and his team used two of Keck Observatory’s instruments – the Echellette Spectrograph and Imager (ESI) and the High-Resolution Echelle Spectrometer (HIRES) – to observe the spectrum of a quasar behind the gas cloud. 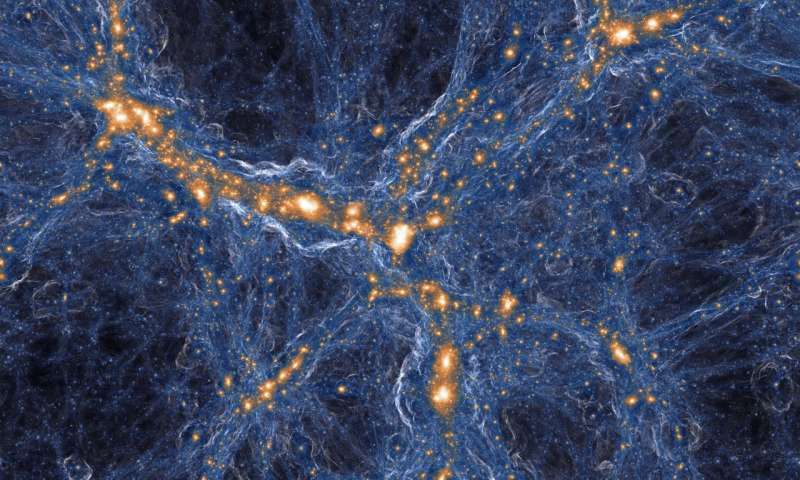 Within the gas in the (blue) filaments connecting the (orange) galaxies lurk rare pockets of pristine gas — vestiges of the Big Bang that have somehow been orphaned from the explosive, polluting deaths of stars, seen above at top of page as circular shock waves around some orange points. The only two other fossil clouds known were discovered in 2011 by Professor Michele Fumagalli of Durham University, John O’Meara, formerly a professor at St. Michael’s College and now the new Chief Scientist at Keck Observatory, and Professor J. Xavier Prochaska of the University of California, Santa Cruz; both Fumagalli and O’Meara are co-authors of this new research on the third fossil cloud. “The first two were serendipitous discoveries, and we thought they were the tip of the iceberg. But no one has discovered anything similar – they are clearly very rare and difficult to see. It’s fantastic to finally discover one systematically,” says O’Meara.